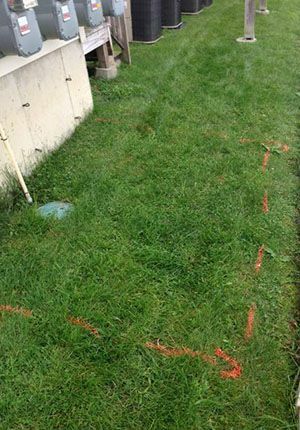 Hodorowski Homes, out of Schenectady, New York was called in to repair cracks found in the cement foundation at an apartment complex in Albany, New York. Hodorowski had a couple options in determining why the cracks were occurring; they could either go into the homes and conduct boring tests, which would have ruined the residents’ floors, or determine if there may be a void present with ground penetrating radar. They decided that using the non-destructive form of testing would be most beneficial. Hodorowski then contacted Ground Penetrating Radar Systems, LLC. to determine if, and when they would be able to locate the possible voids. When they called the technician that covered the Albany area they were pleased to hear he was available to complete the project that day!